@PVaddisaid Webroot would get back to us later this month, two weeks ago. There are still several days left in October. I check frequently because I have computers with Firefox updates turned off on just so I can access my passwords (at least that is working now), but I do want this fiasco to come to an end so I can update. I called them about this issue over a month ago. Safari has the same problem as Firefox. Not able to use password manager for safari and have to use old version of firefox. I have a trial of dashlane as do others. I hope webroot gets this message from all of the unhappy users that have paid for something their are not getting. I am going to ask for a refund if this is not fixed soon. We hear you, we really do. Eager to provide more information once we have a resolution, however right now we are still working on a fix. Wanted to chime in here and apologize for our lack of communication as we do aim for transparency. The password manager is in the works to be fixed, and I am attempting to liason your voice with the product team as much as possible. Also want to say that I really appreciate everyone posting their honest critique, without it we wouldn't know how/where to improve. Going to be working on a method to increase communication and transparency here very soon. Ideally a Google doc or something where I can post live updates as they are worked through, and you all can post feedback as you see fit. Still some items to work through on this idea, so please reserve expectations, however I feel this can greatly impact our current communications (or lack there of). The idea in particular of a live Google document was a very interesting one. .
Do you have any comeback on this? Yes actually I have been trying to get approval of the idea from multiple teams (more difficult than it sounds due to proprietary information). So far it seems like it's possible, however I'm still waiting to get clearance on the PWM issue. Sharing more information with you all is a top priority of mine, however it's a matter of what the product team is willing to allow. I really hope this excellent idea of yours can work out and become reality. Even if not all can be divulged and a live Google document on current progress is not considered appropriate, a few titbits from time to time to keep us updated would, I believe, be greatly appreciated. Hi LLiddell,Your feedback is greatly appreciated. How about communicating to us Webroot subscribers , exactly what progress you and the Team has made, and what progress has been accomplished since Password Manager went missing. On a scale of 1 to 10... what step would you and the Team say your on ? 1 being when Password Manager went AWOL and 10 being ,we are ready to roll out the new and improved Password Manager. Keep up the good work,we all are rooting for you all. I can't disclose any information yet, that's the reason for the lack of communication. I'll send another email to the product team and ask what I can specifically share with you all. Wow! This really takes some guts! Still no reply or solution to this on going problem and yet they send an e-mail touting their “Our award-winning support team”! Give me a break! We’re pleased to announce that we will be releasing a new version of the Webroot Password Manager extension between the end of January and early February of 2019. Powered by LastPass, the new extension will address a number of issues our customers have reported, including browser incompatibilities with Safari and Mozilla Firefox, as well as login and access issues. Many of you have been waiting patiently for news and fixes for some time, and we want to thank you for continuing to bear with us. When we analyzed the code to determine how best to resolve these issues, we realized it would be quicker and more effective to work with LastPass on a new implementation, rather than trying to modify the older code. While the process has taken longer than we would have liked, it will help ensure solid fixes for our customers’ issues, and provide a smoother experience overall. We sincerely apologize for the inconvenience this has caused. Thank you again for your patience. Please keep an eye out for further announcements as we get closer to the release timeframe. Yes, it is an inconvenience, but it is more than that. Are you going to extend everyone's license by 6 months? To compensate us for the 6 months that the product does not work? I totally agree Daniel. It would be great if Webroot was not reliant on other companies so much. Our goal for right now is to get Password Manager back to being fully operable as soon as possible. The fastest way to achieve that is to work with LastPass on a brand new build. I believe that is a good idea. If Webroot can't extend everyone's license then they should give everyone that wants to renew their license on "Internet Security Plus" and "Internet Security Complete" one big hell of a discount for renewing. I understand you have to get the PWM back and operable again but I would like to think that a lesson may have been learned here. As a long term remedy I think it would be more beneficial to bring PWM in house rather than rely on other companies. A problem could probably be dealt with much quicker as soon as it is found rather going to a 3rd party for a fix. A good point about subscription being refunded or extended for people who have just renewed LIKE ME. How is Webroot going to take care of this? So, does this mean that Webroot believes it's a good idea, if we want to use the password manager, for users to stay locked into the previous version of Firefox for an additional 3 months? It seems like fixing this is not a high priority, as there has already been substantial delay, peppered with occasional teasers to keep stringing people along. 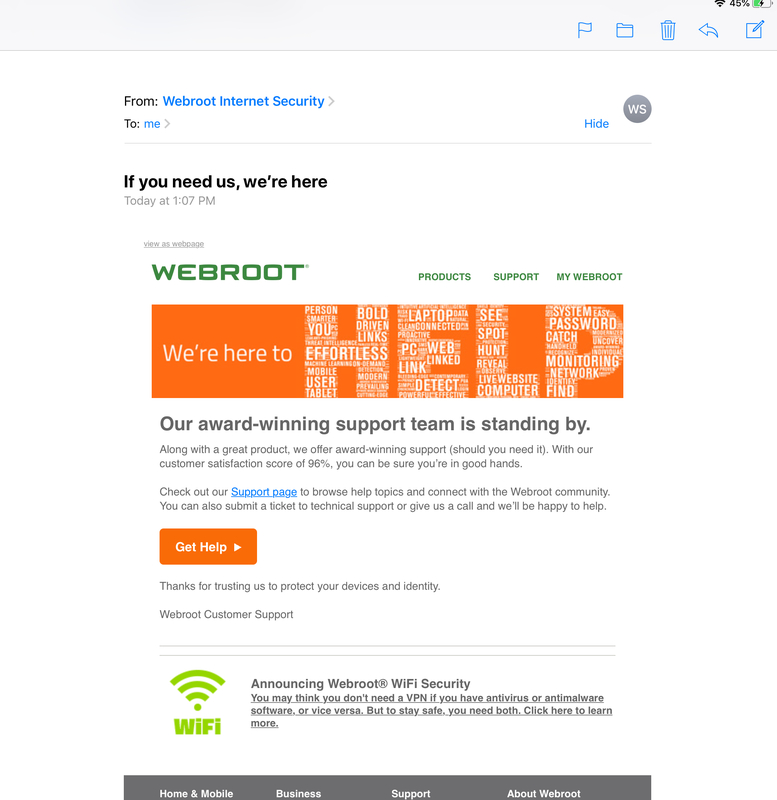 Webroot should not be "pleased" to announce anything like this. More like "It is with deep regret" or "We are ashamed to admit" that it will still be another 3 or 4 MONTHS before our software performs as advertised. I may volunteer my time here, but I am a paying customer, as well, and I am not pleased at all. For PC users, the only difference between Webroot Antivirus and Internet Security was the Password Manager. Now there is NO difference. What a waste. You guys had a good product, and good consumer base to match it. You lost a loyal customer with me. This was the third issue I had with your customer support department. I only hope your subpar solution to this problem inspires more to search elsewhere. History repeats: Webroot will promise, and will fail to deliver. Meanwhile, still very amused that this thread has been "Solved" for so long. Sadly, yet another example where Webroot has let us down- smiling all the way. First I want to assure you that customer safety and satisfaction is of utmost importance to us. We hear you and completely understand the frustration with the delay in getting this issue fixed. We have been chasing issues one after the other with our custom solution and the problems just kept coming. We learnt that the software is simply old and it’s not feasible to keep it compatible with the fast changing technologies it needs to deal with. We have also thoroughly researched and measured the work towards building our own password manager. As we had expected, we found that it will be a huge undertaking and maintaining the product will also require a lot of time and resources. This would take a longer time for us to even come out with a basic solution. Bearing in mind our larger goal and core competency is to protect our customers from hackers while we keep up with the variety of threats out there that are getting more and more dangerous, we decided we should partner with the industry leader in password management and provide you with the best service. With this partnership, you will receive the latest and greatest innovations in password management, advanced multifactor options and priority tech support which is a lot more than what we are able to offer you today. All this comes to you for no additional cost. Request you to have some more patience while we get this integration set up for you and I assure you this will win back your confidence with Webroot. We are working diligently to bring this solution to you as soon as possible. Hope you understand and we really appreciate you being a Webroot customer.